Our Middle Eastern Beef Kabobs is a simple and easy appetizer recipe. Ground beef with za'atar, fresh mint and Greek yogurt make for a flavourful and fresh-tasting appetizer. Reserve 1 tsp. garlic. Mix remaining garlic with meat, egg, lemon juice, 1 tsp. zest, 3 Tbsp. dressing and 1 Tbsp. za'atar just until blended. Shape into 12 (2-inch-long) ovals; thread onto skewers. Grill 8 to 10 min. or until done (160ºF), turning after 5 min. Meanwhile, combine all remaining ingredients. 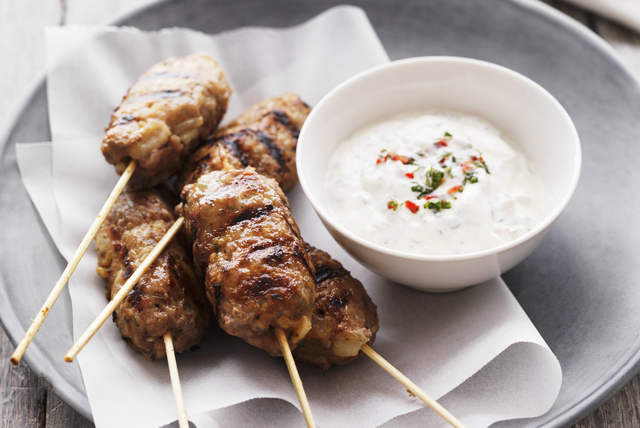 Serve kabobs with yogurt mixture. Substitute fresh parsley for the mint. Prepare using extra-lean chicken, and increasing the grilling time if necessary until kabobs are done (165ºF).